Drug Trafficking, Illegial Gambling, Construction, Robbery. The Pegorino crime family, led by mobster James Pegorino, was an American crime organization based in Alderney, giving rise to its alias "The Alderney Mob." Other important members in the organization included captain (or caporegime) Ray Boccino and associate (or chief liuetenant) Phil Bell. During the storyline, Pegorino hired hitman Niko Bellic, which eventually lead to the organization's downfall, depending on the player's choice. 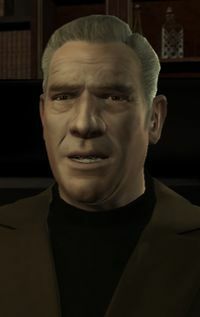 The Pegorino crime family are first introduced in the storyline by Patrick McReary, a prominent figure in the Irish mob, after McReary and Niko Bellic successfully steal a shipment of pharmaceuticals for Pegorino captain Ray Boccino. Boccino later calls Bellic, offering him work in exchange for the location of Florian Cravic, a man who Niko suspects betrayed him and his squad of fifteen men during the Yugoslav Wars. It later becomes clear that Boccino doesn't even attempt to find Cravic, but only uses Bellic to solve his problems. Bellic later meets Phil Bell, a member and figurehead in the organization. Bellic decides to work for Bell instead, ignoring Boccino's constant advice and demands. Eventually, Niko finally meets the boss of the crime family, James Pegorino. Pegorino hires Bellic, later ordering him to murder mob turncoat Anthony Corrado, who Pegorino once apparently favored as a son. Near the end of the storyline, Pegorino orders Bellic to go with Bell to pick up the payment from a heroin deal which Pegorino had recently made with Dimitri Rascalov, to which Bellic reluctantly declines, considering Rascalov's constant attempts on his and his cousin's lives. After Bellic leaves the bar, he is given a choice: either watch over the deal or take revenge on Rascalov, after finding out his location through his cousin. If Bellic accepts, and watches over the deal, Rascalov reveals to Bellic over the phone that he has murdered the buyers' representatives, taken the heroin for himself and has already made his escape. Bell, believing that they will not be able to escape alive, begins to draw fire and goes after their money, with Bellic in tow. They eventually escape with their money and Pegorino thanks Niko over the phone, commending him on his work and dedication. A Day later, after another attempt on Niko's life, which eventually leads to the accidental killing of Bellic's cousin, Roman Bellic, Niko seeks revenge on Rascalov with one of Bellic's associates Little Jacob. Days later, Bellic and Hughes follow a Pegorino member, in the hopes of him leading them to Rascalov, after rumours of Rascalov and Pegorino's recent partnership. Eventually, the Pegorino member notices Bellic and Hughes and seeks solace in a run-down casino, which Pegorino and Rascalov happen to be having a meeting at. Bellic demands that Hughes leave, claiming that he does not want another friend hurt. Bellic then opens fire and eventually reaches Rascalov, who is holding Pegorino at gun point. Rascalov then fires, shooting Pegorino in the face, much to Niko's surprise, leaving the organization in ruins. If Bellic decides to take revenge, instead of watching over the deal, Pegorino, betrayed, takes fire on Bellic with an AK-47 during Roman Bellic's wedding, murdering Niko's partner Kate McReary, who was also the sister to Irish mobsters Gerald McReary, Patrick McReary, Derrick McReary, and corrupt cop Francis McReary. In retaliation, the two Bellics and Hughes seek revenge. The same situation plays itself out, only Bellic murders Pegorino on Happiness Island, after a lengthy chase. After the events that took place in the storyline, it's been assumed that the Pegorino family was dissolved, as Phil Bell, the only known living member, claims that he is leaving town in order not to face any more problems that arise, which are in any way associated to the organization. The Pegorino family and the Rascalov Family are seen fighting Niko together in A Revenger's Tragedy, but only Pegorinos fight Niko in Out of Commission as Dimitri Rascalov has been killed in A Dish Served Cold in the Revenge Storyline, therefore the Rascalov Family has ended. It is unknown if the family gets a seat in The Commission or is just about to. Pegorino seems happy when he rings you if you decide to do the Deal Storyline, though this could be because he thinks he will be able to buy a place in The Commission with the money he earns from the deal. The Pegorino family is more than likely based on the real life DeCavalcante crime family from New Jersey, which are the family in New Jersey who weren't given a seat on The Commission until recently.